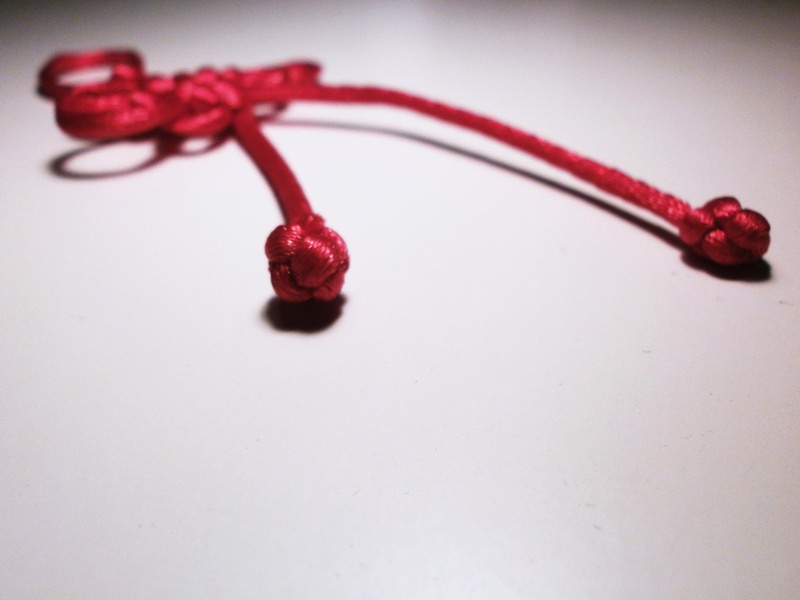 In a previous post from a few years back, I made some Chinese knots for Chinese New Year 2010. Well, January 23, 2012, is the date for this year, and it’s fast approaching! I still had some of the same red cord from that previous project, so I decided to try and learn a new knot. And I picked a doozy of one called the Pan Chang knot. It took me a few times, but I finally got it. I had to get some cardboard and stick some pins in it to keep the cord where I wanted it, but in the end it turned out kind of cool. I had take more photos, but when you work at night and your room has incandescent lights and therefore a dim yellowish hue … it’s just too much work trying to make them presentable. Anyhow, I missed using Adobe Illustrator so much I decided to use the program to make a little guide. Yay. 1. Get some cardboard stack it up (two or three layers so the pins stay in). 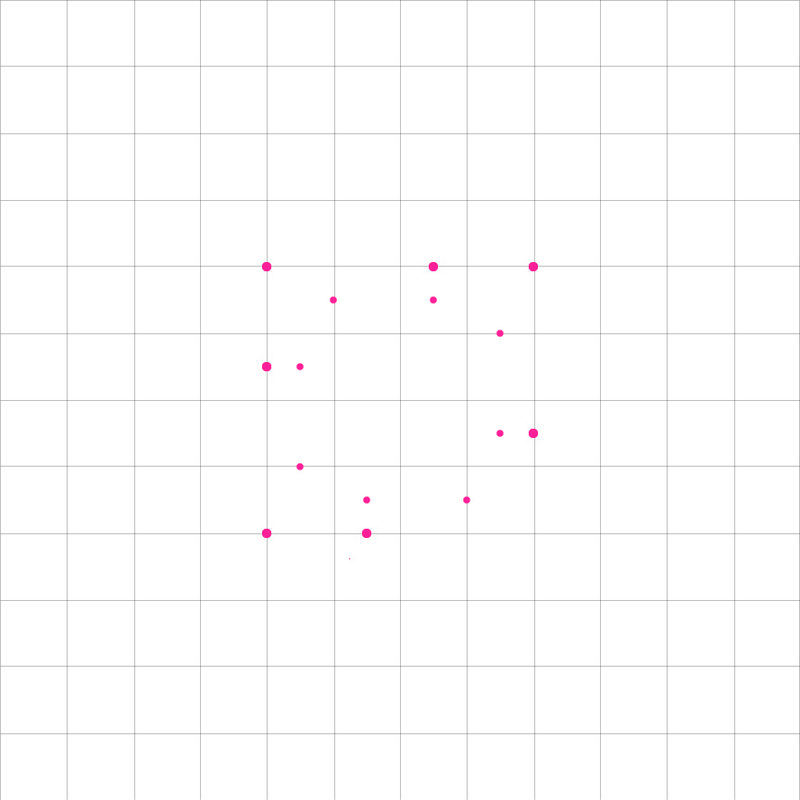 Then following the guide, put pins where there are pink dots. 2. Get some cord/string that’s got some thickness (red is a lucky color). You’ll need about a yard … maybe more. 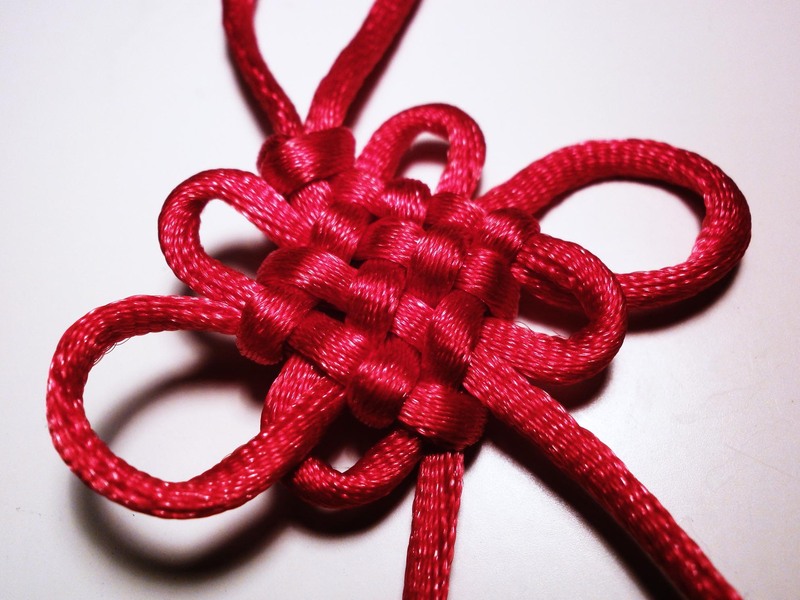 In the middle, create a loop tied off with a knot. With one end, string the cord around the pins following the guide – stringing it vertically and then horizontally. Make sure to note when it goes over/under the already-laid cord. 3. With the other end of the cord, you’ll weave it through vertically and then horizontally. Again, make sure you take note when the cord is supposed to go over/under another one. 4. And that should be that. Carefully pull the cord up from around the pins and carefully pull on the outer loops. 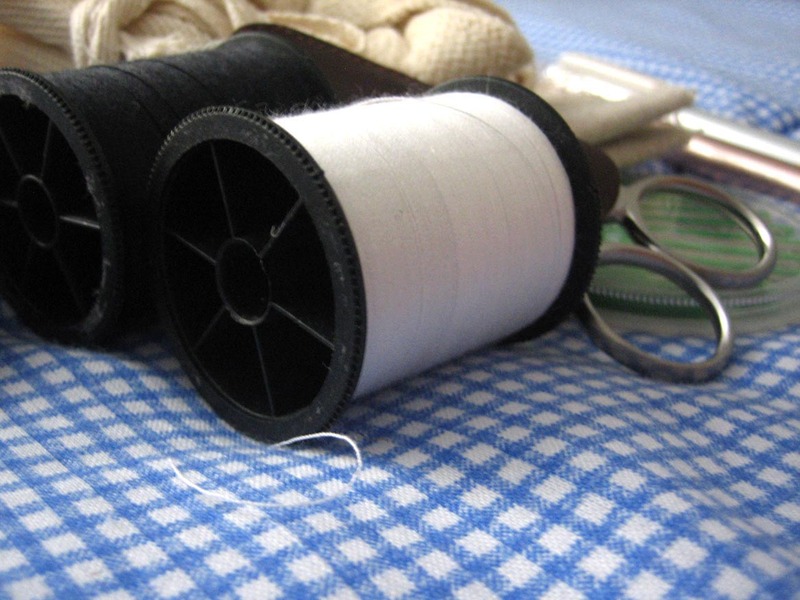 After you get the center roughly squared away, then you can begin adjusting the length of the loops by slowly working the cord through the piece, tightening along the way. 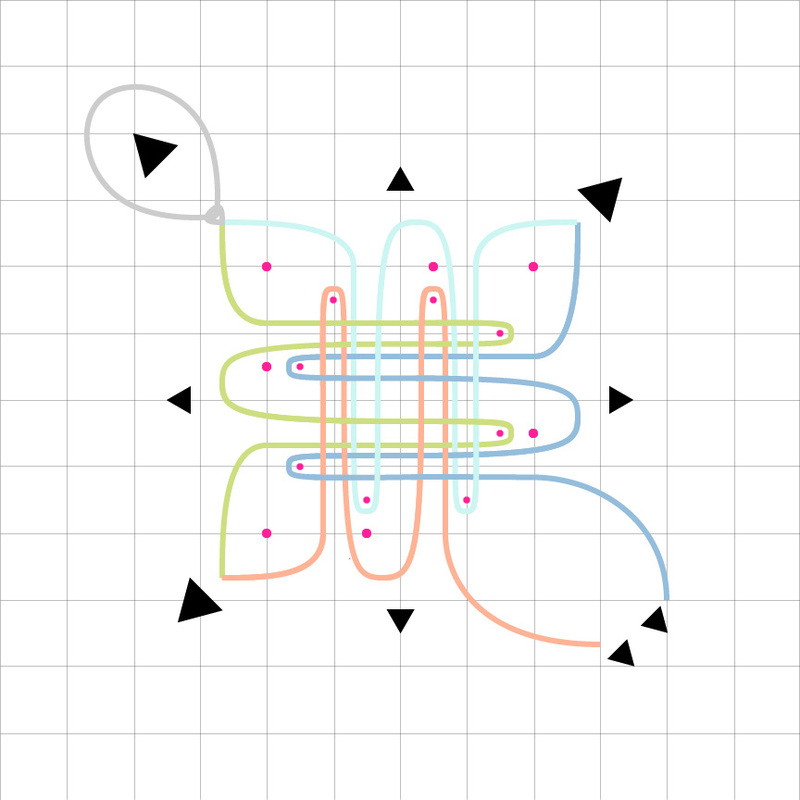 The original knotted loop should be tight to the center square, and the two side loops should be bigger than the four other ones. 5. Voila! After all the tightening you’ll have to trim the ends of your cord. And then you can either leave the ends hanging or finish them off with some button knots. Whew. Wasn’t that fun? I don’t have enough cord to make another knot, so that’s it. It’s kind of a small thing to show for all the time and effort I put into making it. It was fun though. 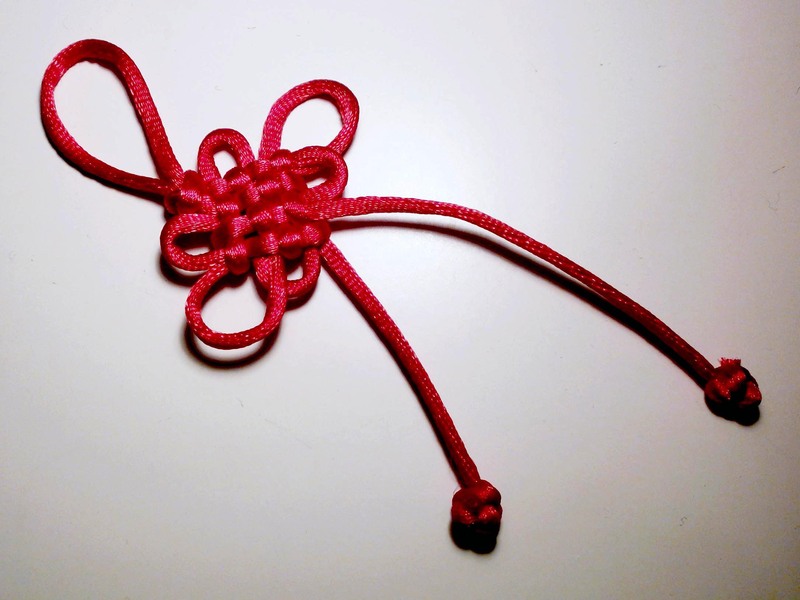 Once you make one successfully you can sort of understand how the knot is constructed. The one I made here has four rows, but you can easily expand the knot to have six or eight rows just by increasing the number of vertical and horizontal moves you make. Good luck! Wishing everyone a happy new year! Did I ever mention that I am quite the procrastinator? Well, here’s proof. I finally finished a cross-stitch that I’ve been working on for the past few years. It’s not that big (about 12″x12″) and I really have no good excuse for why it took so long. This cross-stitch saw me graduate high school, graduate college, go off exploring, and start graduate school. Yeah … when I say that this took me a “few years,” what I really mean is 7 and a half years. Oh yes. I received the pattern from a friend for my 16th birthday. We had taken biology together, and for a bug-collecting project, we managed to catch some butterflies. In the process of pinning them to the board, some of the wings fell off and we became the wingless butterfly friends. She gave me the cross-stitch as a reminder of that. We actually haven’t talked in about five years or so and we’ve both just changed so much, but I’m glad that I’ve finally been able to complete her gift. Kind of bittersweet in a way. The cross-stitch is completed, we’ve lost contact, time has moved on … seems kinda final. I like to make my own cards for Christmas because I feel like there are very few good ones out there that are unique but simple enough for my taste. And cheap enough for my budget. I’m currently experimenting, so I’m not sure what I’m going to end up with, but it’ll probably just be black ink on white card stock, with maybe some added ribbon … maybe. 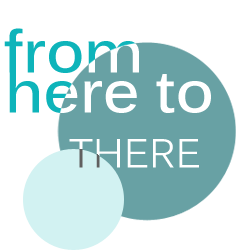 I really want it to have a modern, simple look, where the typography takes precedence. Hm … I’ll have to play around more with it. I don’t want it to be too boring, but if I’m making a whole buncha cards, I couldn’t go too complicated either. Any suggestions? I’ll just shelve this for a while until I figure out something I’m completely satisfied with. 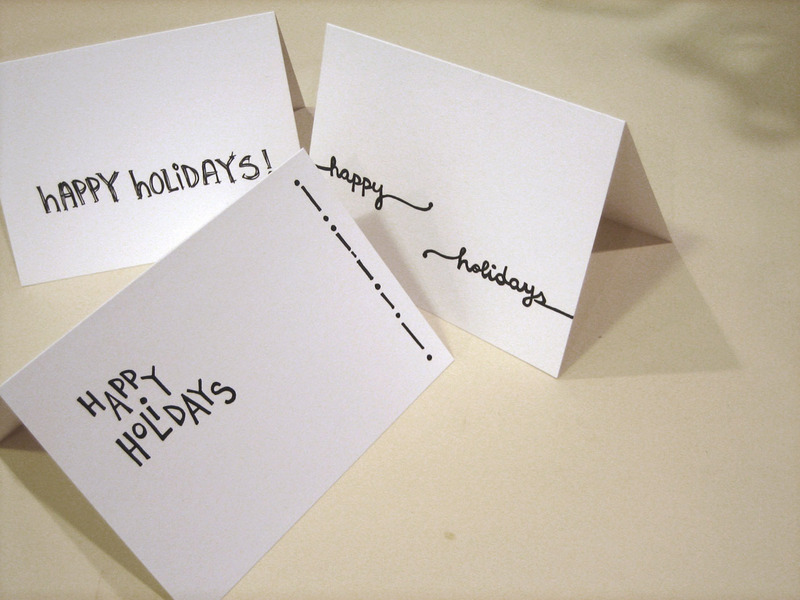 After all, I still have over a month to make and write these cards! 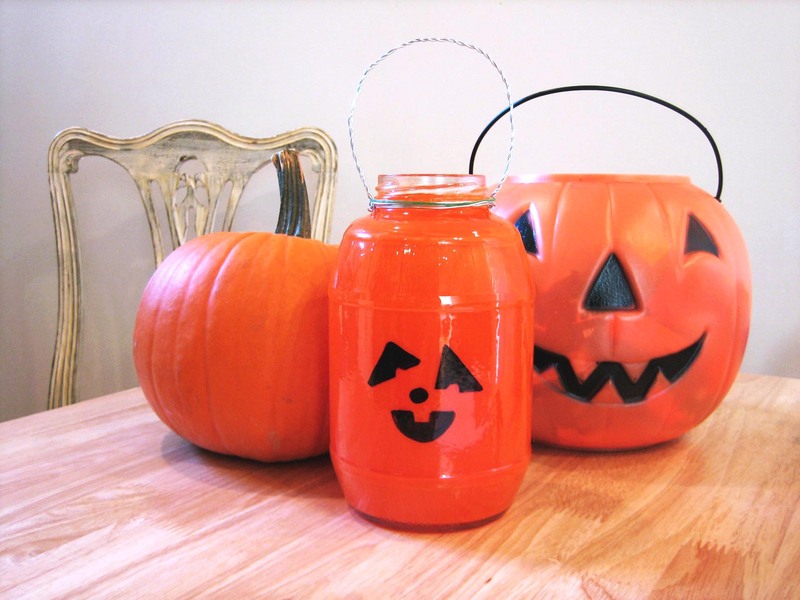 A while ago I had seen this Martha Stewart project for Jar-o’-Lanterns and I thought, I got jars and I could easily get paint. So voila. 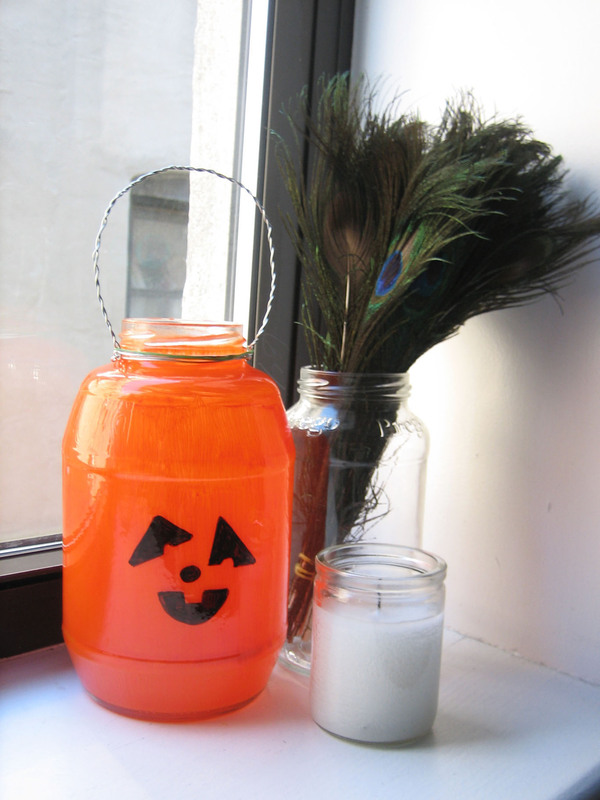 I decided to make my little jar-o’-lantern be a happy little guy, so I just freehand drew his face on with a permanent marker and let it sit so the marker would dry. Then I headed down to Michael’s to buy orange paint. I probably should’ve gone with the recommended oil-based enamel paint … but the orange acrylic was cheaper. And whatever, it looks fine. Oh, and the wire was just some normal silver 16-guage I picked up at the local hardware store. Simple and cheap – why does Martha have to make it seem so much more complicated? Right now I’ve got him on our table in the living room, hanging out with our plastic pumpkin (filled with chocolate) and our real pumpkin (which is waiting anxiously to get carved). Now if only I can find some green ribbon to tie onto the silver wire, I’d be completely satisfied with it. In total, I only spent about $4 for the project since I only had to buy paint and wire. Yay! My last real post on this blog was over a year ago. Whups. Anyway, I’m back from my adventure in China and I’m settling into college life again, only this time it’s graduate school and it’s New York now. What a change, eh? Unfortunately I couldn’t bring much stuff, so my crafting stuff is rather minimal at the moment. And by minimal, I mean bare minimum. Yikes. I’m going to have to seriously restrain myself from going on a shopping spree at Michaels to replenish my craft stash. Nope, I’m not dead and I haven’t fallen off the face of the earth. Wow it’s been a while since I posted anything. Busy with finals and such. Graduation is coming up, tonight is my last final, and then I have a whole host of things to do. By the way, does anyone need a place to live during the summer in Austin? If you’re in the market for an apartment, let me know! I haven’t done anything crafty in a while. A week or two ago I made this little pouch when I was particularly bored. Nothing too impressive. After tonight things should be better … I hope. Probably not though. I still have to pack, sell things, find someone to sublet. And then I have a list of Austin restaurants I have to go to before I leave and friends I need to see before we all depart. That’s okay though. I think I’d rather have too many things to do than nothing. I’d be too bored with boredom. Lately I’ve been participating in swaps over at swap-bot.com, which has been quite fun. For the latest swap I had to send something handmade. So … if you’re in that swap and your name is Clara, stop reading here (because I haven’t sent it yet!). I have a lot of fabric, so I’m going to try to use it by sewing stuff. 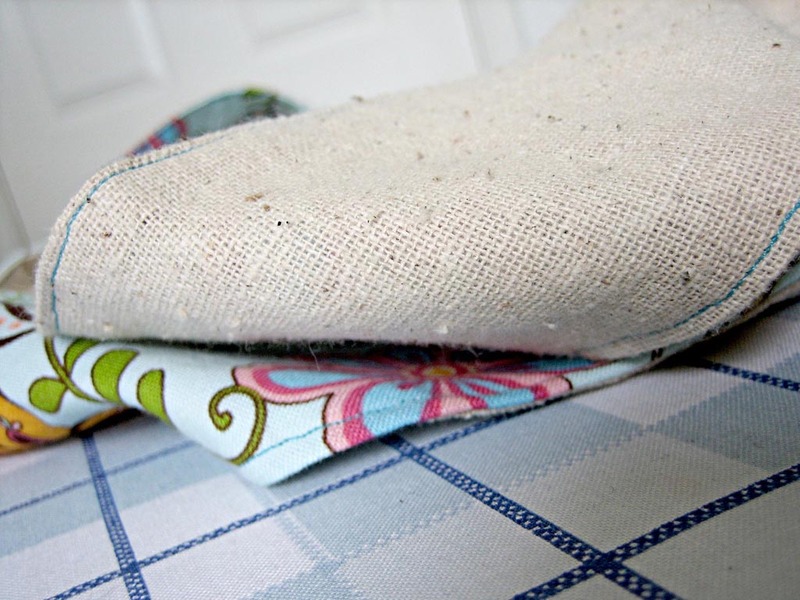 I found a pretty simple tutorial for a bag which you can find here that I decided to use for the swap. 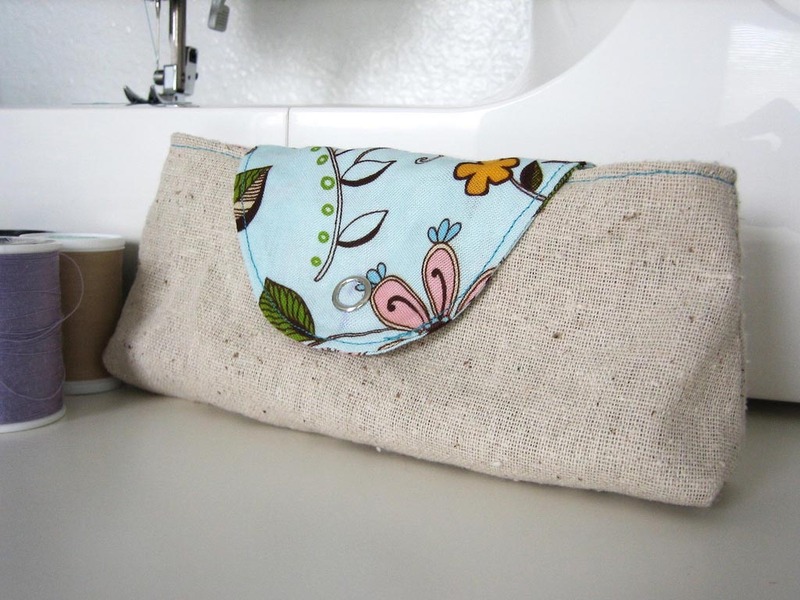 I think the bag came out rather nicely, but next time I make one I’ll probably change the fabric and shape. Other stuff is in the works and hopefully my self-imposed deadlines hold fast. Now I’m off to actually do homework! On Tuesday I went shopping. Yikes. But it wasn’t aimless shopping, I was armed with a list … and for the most part I stuck to it! I always seem to have lists and lists of projects in mind, so we’ll see how many I finish by the end of the school year. Bought some fabric, beads, and such. I’m planning to make a simple little pencil pouch because since my purse is so huge, I can never seem to find any writing utensils. On the other hand, with a large purse, I can carry around my entire life with me … yay! 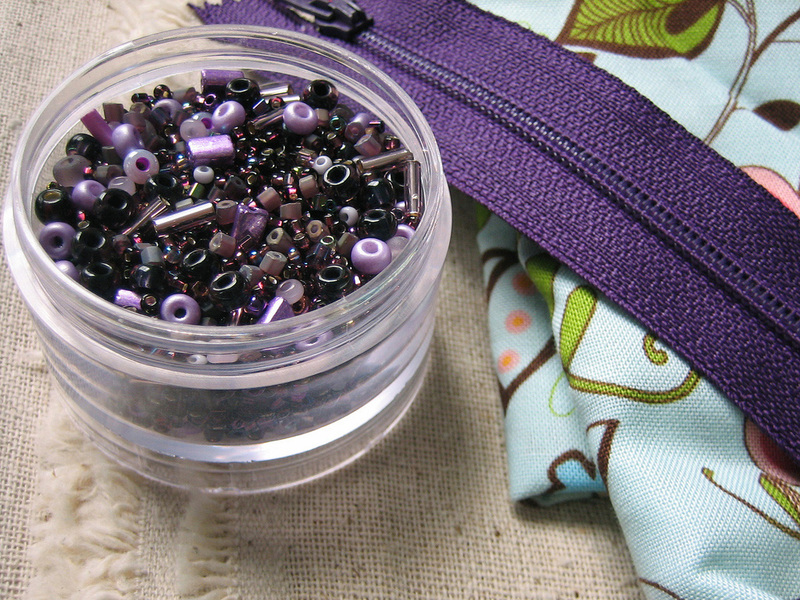 The beads don’t have anything to do with making the pouch, but they were purple and pretty and I couldn’t help myself. I have a whole stack of frames that I’ve been trying to use since my original grand plan for them fell through. I used one for this gift and used two more here, leaving nine sitting in a stack under my bed. 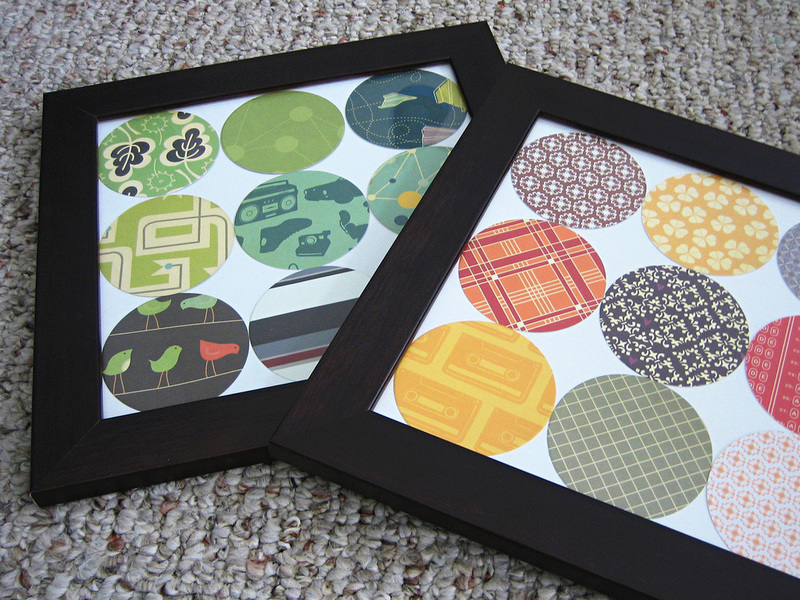 I received the circles of paper in a swap, but since I don’t scrapbook and rarely work with paper, they were kind of useless to me. So I stuck ’em in frames and ta-dah, instant art. That’s all that’s on my plate for now. I got some real world stuff to get done (oh laundry, why do you never end?) and a story to finish, so hopefully I’ll have projects in motion within a few days. Linking over to kootoyoo’s blog for a whole lotta creative spaces. 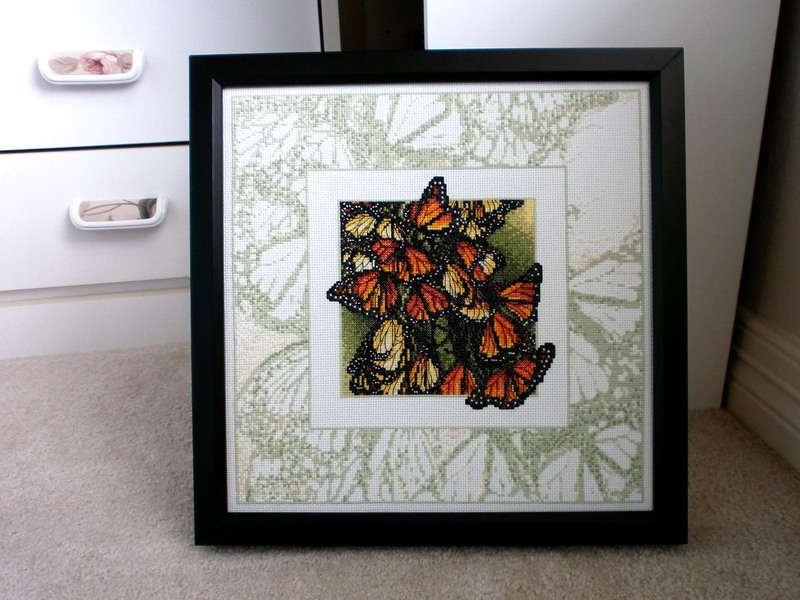 I finally finished the gift I had blogged about in my last post. Here it is! I know, you’re probably scratching your heads trying to figure out what the heck it’s supposed to be, so I’ll do you the favor and explain. First of all, it’s art, so it’s not meant to do anything but hang on the wall and look pretty. I cut out the letters of my friend’s name in various fonts out of green card stock. 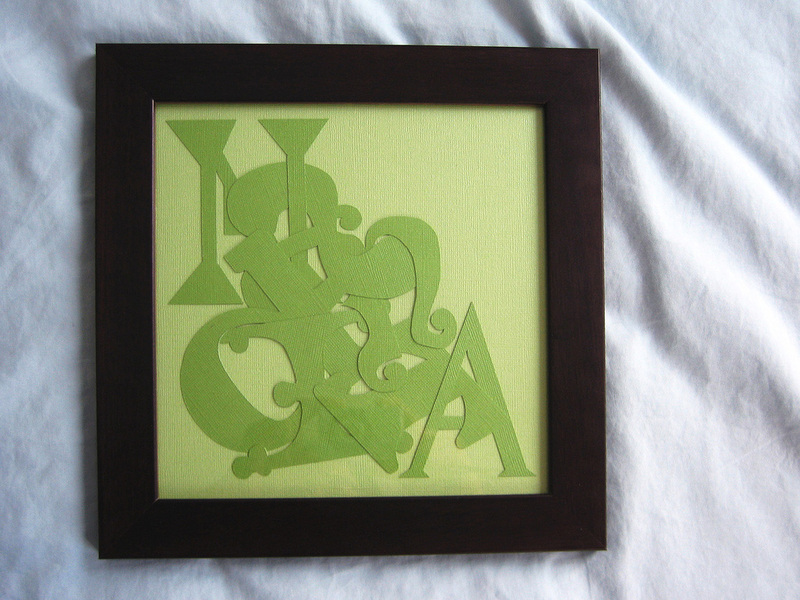 Then I randomly jumbled carefully arranged said letters on another piece of green in a lighter shade, stuck it all in a frame, and voila. Pretty simple and I thought it was rather cute. Whaddaya think? My friend’s birthday is coming up, so I’m working on a little present for her. I couldn’t think of anything to get her and since she’ll be moving soon, I didn’t want to get her anything to bulky. I’m making her a little art piece to hang on her wall. 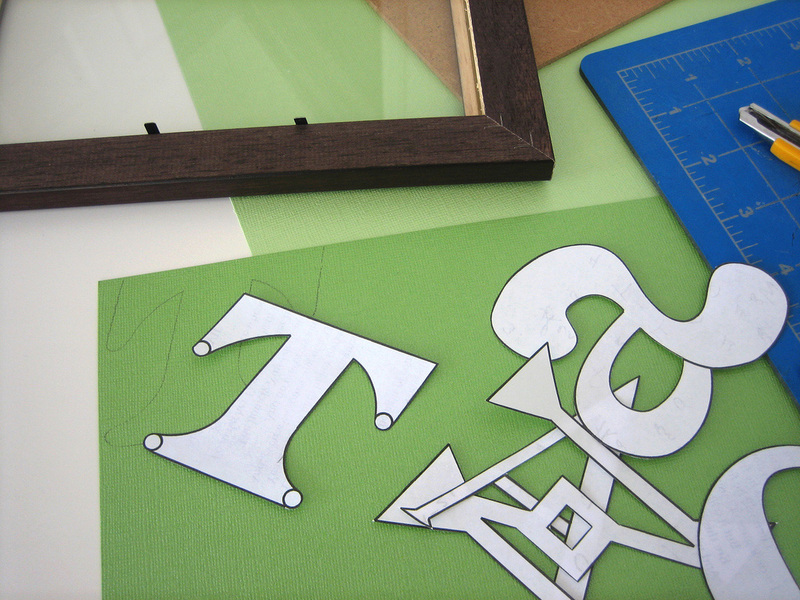 Green card stock, a picture frame, and some funky letters. Hopefully I’ll get it finished tomorrow, but … ya never know. More creative spaces here at kootoyoo!